Stephanie Gerbier goes to work dressed for combat: She wears body armor under her white apron, steel-reinforced shoes and a metal glove on her left arm. Her weapon of choice is a flat, razor-sharp knife. She can truss up a garnet-red round of beef to look as exquisite as a gift-wrapped jewelry box, carve $17-a-pound veal scallops so thin that the pink slices are nearly translucent and extract precision cuts from a 660-pound side of beef. For those skills, the 23-year-old Gerbier this year became one of the first two women to win France's annual competition for best apprentice butcher. Gerbier is breaking cultural barriers in a trade that mirrors the transformations in the European workplace of the 21st century: The attraction of prestigious white-collar and high-tech professions has steered young people away from Old World artisanal crafts, many of which traditionally have been open only to men for centuries. As a result, women are more able to enter trades that were largely closed to them. Facing a shortage of as many as 5,000 butchers, France's historically macho meat industry has begun welcoming women. 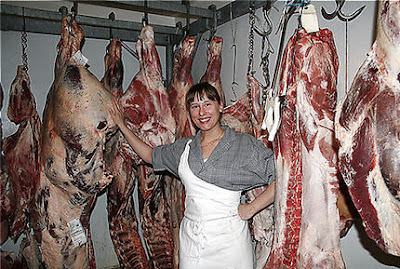 This summer, the national Federation of Butcher Shops is targeting women in a major recruiting drive -- and promoting Gerbier as one of its new female success stories in a field that now has about 100 female certified butchers, according to federation spokeswoman Cecile Mousset. "The only drawback to being a woman butcher is that you can't carry heavy pieces of meat like a 90-kilo [200-pound] leg on your own," said Gerbier, who just earned her two-year professional aptitude certificate. "I always need to ask for help, but that's a minor inconvenience." The butcher shortage comes as the French butcher shop -- considered by many French consumers to be the heart of the national culinary obsession -- is struggling to survive in the face of growing competition from supermarkets and an expanding fast-food culture. In the past three decades, France has lost nearly half of its butcher shops: 21,000 are open today, down from more than 40,000.
a great picture.look forward to reacting with all strong woman and butcher ladies.